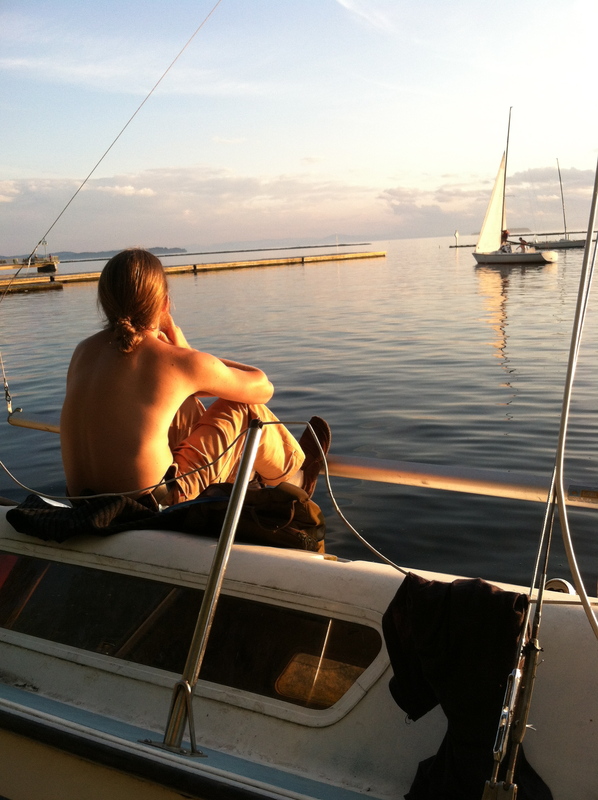 Good friend Jeremy, relaxing on a ship-wreck, contemplating the health of Lake Champlain, amongst other things. Lake Champlain is still severely impaired. The seasons can have a comforting effect on us. When the world news portrays turmoil and turbidity in the streams of humanity, we take comfort in the peace we enjoy in this land of changing leaves and harvest moons. It seems we’re immune to the worries of the world. We don’t have oil rigs, and hence no oil spills. We don’t have mining, so we don’t have toxic tailing ponds. We don’t have a dominating timber industry, so we don’t have clear-cuts. We don’t have political instability, so we don’t have riots and food-shortages. And autumn is just gorgeous. We seem to be sitting pretty. And yet, Lake Champlain is still severely degraded. One reason we’re able to live this well on this land is because we’ve outsourced all the nasty processes. Our cars, phones, computers, clothes, and most of our food is produced elsewhere. After three centuries of heavy use, much of this basin is being allowed to rest, and to recover. Other places aren’t so lucky– they’re ramping up production to meet the desires of modernity’s decadence. We’re fortunate to not be dealing with any of these big-time problems affecting us locally. And yet, Lake Champlain is still severely polluted. Here’s the harsh news: we’re still participating in a cultural life-style that is destroying our water. Let’s not get used to this. It’s a tragedy that the lake is often closed to swimming. It’s a tragedy that we shouldn’t eat more than two fish a month. It’s a tragedy that our drinking water needs to be shocked with chlorine to make it safe to drink. Consider this from the arc of human history, and how unfortunate it is– we can’t eat and drink from the natural bounty we live upon. Let’s not be lulled into thinking this is normal, or okay. Because Lake Champlain is still severely impaired. But here’s the positive news: we’re capable of restoring this entire basin, one watershed at a time, and we can restore our relationship to this place in the process. The future will likely require us to meet more of our needs on this land base again, and we’re going to need clean water to do it. To get there, it’s going to take a lot of work, but I reckon we’ve never been afraid of that. It’s going to take a lot of time, but it will be time spent together. We’ll have to realize that this modern life will never be satisfying if we aren’t all feeling healthy, vibrant, and inter-connected with one another and the water and land. Here’s a few questions we must ask ourselves. 1) What watershed do we live in? When water flows off our yard, toward what stream does it flow? Where does that stream go? 2) What’s the water do when it runs off of our farm, land, or street? Is it gathering chemicals and fertilizers? Could we slow it, spread it, sink it? 3) What long-term affects will gas pipelines have on our water? 4) What projects are going on in our watershed? Lake Champlain is fed by rivers, and many rivers are damaged. Seek out watershed groups or businesses dedicated to helping organize projects– Friends of the Winooski River and Intervale Conservation Nursery, for example. Try volunteering a Saturday to restore a riparian corridor, or attend a city-council meeting. Advocate for better storm-water management. Encourage youth to become ecological restorationists! We know future generations will swim in this lake, drink this water, eat these fish, watch these sunsets, and marvel at these seasons. Will they look back on us and our efforts with thankfulness or despair? The answer’s up to us, flowing by us and through us everyday, in the water and air.